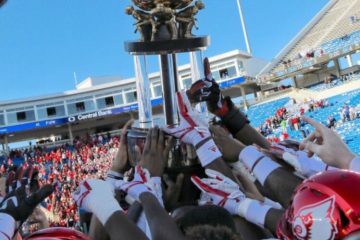 Louisville’s Wide Receiver Corps is perhaps one of the best in the nation and is arguably Cardinal Football’s most complete unit. The Cardinals were not a ‘great’ passing team in 2015, but still managed to catch 3186 yards through the air. There is a HIGH ceiling for productivity in this group because of the gains at Quarterback….but also because of the growth and development of the group itself. The Cards also have replaced former Wide Receivers Coach Lamar Thomas with Lonnie Galloway who comes from West Virginia and is now Louisville’s Co-Offensive Coordinator. Jamari Staples returns to Louisville as its most dangerous weapon in the passing game from 2015. Staples, however, struggled staying healthy last season and when he missed the first 3 games of the year…..the Cards lost. UofL was 8-2 with Staples available. So he’s important, he’s a veteran and he provides a quality on the outside that Louisville needed last year. This Fall Camp Staples looks more accomplished than ever and appears to be in great physical condition which is opposite of his 2015 Fall Camp. A healthy camp and a year better + Lamar Jackson improving…… Staples should have a big year. Another senior is James Quick. 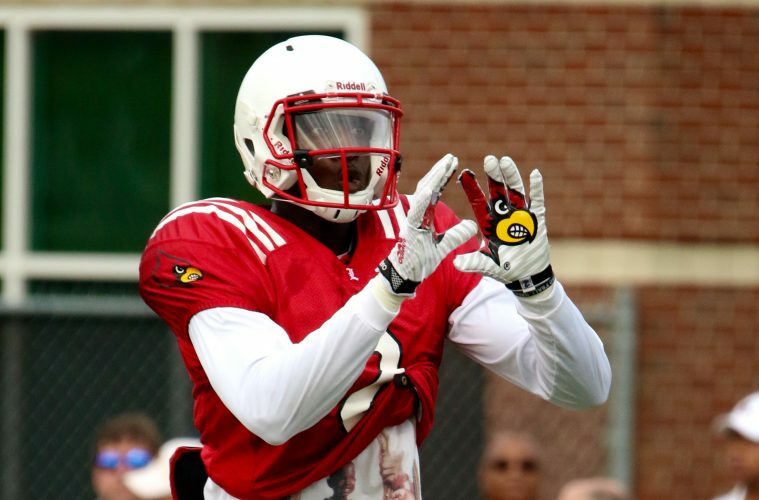 No other recruit came to Louisville with more hype than James and Quick has been a good WR…..but he hasn’t been great. We’ve seen in flashes what the hometown product is capable but consistency has been an issue especially when handling sure completions. Focus has been a problem for James but a player’s senior season has a way of changing that. It’s also not to be forgotten that Quick made THE PLAY on special teams versus Virginia. This Fall Camp Quick looks fast and he can get OPEN…. but can he consistently make the catch? We’ll have to see. Quick will work out of the slot and also on the outside. All kinds of talent, let’s see if we use it all in 2016. But where Louisville has huge room for improvement is with the young players who got valuable time last season. Freshman have turned into sophomores: Jaylen Smith, Devante Peete, Emonee Spence & Traveon Samuel. Jaylen Smith is Louisville’s #2 Wide Receiver in the Open Practices we observed. Jaylen is BIG and had a big year as a freshman. We expect that Smith as a deep threat is going to be a big time problem for defenses as well as his willingness to go over the middle. Jaylen is a natural receiver and he’s the player I’m picking to surprise fans the most with his production. Traveon Samuel is a slot guy who is going to get his number called A LOT this season and maybe not all in the passing game. We saw Samuel in some specialty packages in the backfield. Fans probably remember Traveon most for his contributions to the return game last season, but he’ll be targeted much more in the passing game in 2016. Devante Peete is another BIG body and was used last year as a big play jump ball guy. He’ll still be that in 2016 but hopefully with much more consistency AND with other facets of his game. Peete has a ton of ability and great hands. He just needs some better body control last season to have 4-5 more huge catches. Emonee Spence was the talk of Fall Camp 2015 and saw some action as a true freshman. Emonee looks like a natural wide receiver out there runs great routes has soft hands, it’s just a matter of time before the big plays start coming for Spence. We’re really excited how much progress has been made with this group because if these 4 players make the typical freshman to sophomore leap……….LOOK OUT. One new addition that everyone is really interested to see is Reggie Bonnafon at Wide Receiver full-time. Last season Reggie was a RB/QB for the Cards and we still think there will be specialty package that involves Bonnafon out of the backfield, but he’s a wideout in 2016. We’ve seen incredible vertical numbers that Reggie posted and we’ve seen Reggie at QB and Running Back. But it’s time for Reggie to find a home and start working on establishing himself at a position. He’s a team leader and a great ambassador of the program so fans are really hoping that Reggie comes in and owns his position in 2016. During Fall Camp Reggie looks good at WR, but it is really hard to tell where he is in the pecking order. He’s a team leader and a natural athlete so it’s just a matter of time before he gets going at wideout. Javonte Bagley is a player whose game has caught fans attention in practice for the past two seasons. Bagley looks like a natural at Wide Receiver and would probably start at most programs. Ja’Quay Savage is someone who needs to do more to live up to his reputation, Savage has claimed a new focus and work ethic for 2016 so we’ll see if that has paid dividends. Gio Pascascio is super fast and Pat Thomas has been in the program for awhile now so we’ll see if either of these guys has made strides to crack the regular rotation. The new freshman are exciting and if this was last year we’d be expecting to see a lot of this group. In Fall Camp Dez Fitzpatrick looked like a natural route runner and was more than willing to go up and get the football. Dez looks ready to contribute this year, but it may not be necessary to burn the redshirt in 2016. Seth Dawkins sounds like he’s going to factor in 2016 in the kick return game as Bobby Petrino made it known that he’s excited about Seth returning kicks opposite of Traveon Samuel. Dawkins is HUGE and has the biggest hands on the team, as a wide receiver he’s going a lot to work on but his potential is through the roof. Keion Wakefield is a definite slot receiver on a team with two really good ones already and other veterans vying for snaps. At this point it looks like Keion is a sure fire redshirt candidate and that’s a great thing for both Wakefield and UofL Football. Keion will be able to develop his body, learn the offense and let some of the guys ahead of him graduate. Redshirting any of these 3 guys is a signal that the program is on the right track.